Interesting article released from The Hill by authors Nazgol Ghandnoosh and Alex Nowrasteh claims that recent research shows that immigrants—regardless of legal status—commit property and violent crimes at lower rates than native-born citizens. This research, conducted independently by The Sentencing Project and the Cato Institute, used different methods but arrived at the same conclusion: Immigrants are less crime-prone than native-born citizens. Overall, non-citizens are actually slightly underrepresented in prisons, comprising six percent of the prison population compared to their seven percent of the total U.S. population. Nazgol Ghandnoosh is a research analyst at The Sentencing Project and the co-author of the report Immigration and Public Safety. Alex Nowrasteh is an immigration policy analyst at the Cato Institute and a co-author of the report Criminal Immigrants: Their Numbers, Demographics, and Countries of Origin. My opinion? This certainly is a highly politicized and hot-button topic. Hopefully, we’ll all arrive at solutions which do not unlawfully violate people’s constitutional rights, regardless of their immigration status. Please contact me office if you, a friend or family member are charged with a crime; regardless of immigration status. Hiring a knowledgeable, effective and experienced criminal defense attorney is the first step toward getting justice in our courts. Informative article by reporters Nina Shapiro and Vianna Davila of the Seattle Times says that the Washington State Department of Licensing (DOL) will no longer release personal information to federal immigration authorities without a court order unless required by law. Apparently, the DOL gave photos and driver’s-license applications to Immigration and Customs Enforcement (ICE) — information that was potentially helpful in arresting and deporting people. According to reporters Shapiro and Davila, the Seattle Times first reported the agency’s practice Thursday, revealing that DOL was handing over personal information to federal authorities 20 to 30 times a month. The policy was surprising to many, given that Washington is among a minority of states to allow undocumented immigrants to get driver’s licenses. In another major shift announced in a news release Monday, DOL said it would use emergency rule-making to end its practice of collecting “information that isn’t mandated and could be misused,” specifically information on license applications about where a person was born. The release did not say whether the application would continue to note the IDs a person used to obtain a license. Those IDs could include a foreign passport or other documents that might signal someone does not have legal status. The agency also has accepted the resignation of Deputy Director Jeff DeVere. DeVere oversaw compliance with an executive order that Gov. Jay Inslee signed last year, designed to prevent state employees from helping federal officials enforce immigration laws — an attempt to thwart President Donald Trump’s approach to immigration enforcement. Until questioned by The Seattle Times last week, Inslee’s office didn’t know the extent of DOL’s cooperation with the feds, according to his spokeswoman, Jaime Smith. The response to the licensing department’s policy of cooperating with ICE was swift and furious. The governor ordered DOL to direct future requests from federal immigration officers to his general counsel. State lawmakers pledged to file a bill to ensure the practice was stopped. Monday’s announcement from the department included an apology, and made clear that the offices of the governor and Attorney General Bob Ferguson had a hand in the changes. She went on to say DOL “did not clearly communicate” the information federal law enforcement was requesting nor seek clarification with the governor’s office and the Legislature about how to handle those requests. The agency also announced it would review its processes and computer systems with the governor’s and attorney general’s offices; hire a community liaison to ensure DOL practices “meet the needs of all Washington residents”; start a new hotline to answer questions about the issue; and educate agency staff on all policy and procedural changes and the governor’s executive order. Excellent article by Jeremy Raff of the Atlantic claims that although only 7 percent of non-citizens in the U.S. are black, they make up 20 percent of those facing deportation on criminal grounds. The reason for higher deportation rates? Research suggests that because black people in the United States are more likely to be stopped, arrested, and incarcerated, black immigrants may be disproportionately vulnerable to deportation. 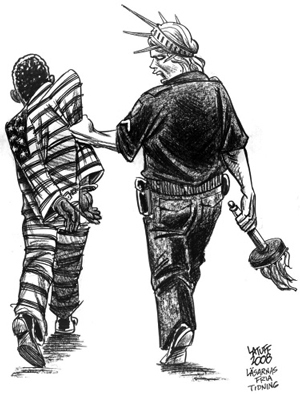 According to Raff, more than half a million black unauthorized immigrants in the United States—about 575,000 as of 2013. Last week, The New York Times reported that the presence of immigrants from Haiti and Nigeria, who together represent roughly 20 percent of the foreign-born black population, vexed President Trump. The Haitians “all have AIDS,” Trump said in a June meeting with his top advisers according to the Times, while the Nigerians would not “go back to their huts” after seeing America, he said. (The White House denied the comments). But Hernández sees something different in the large number of criminal convictions among ICE detainees. Raff also reports that a 2016 report by the NYU Immigrant Rights Clinic, where Das is the co-director, and the Black Alliance for Just Immigration found that although black immigrants represent about 7 percent of the non-citizen population, they make up more than 10 percent of immigrants in removal proceedings. Criminal convictions amplify the disparity: Twenty percent of immigrants facing deportation on criminal grounds are black. According to Raff, aside from ICE’s splashier arrests within so-called “sanctuary cities,” most apprehensions nationwide happen inside jails once an immigrant has had contact with local police. This collaboration is a result of decades of legislation and executive action by both Democrats and Republicans. Two years after the passage of his controversial crime bill, former President Bill Clinton signed the Illegal Immigration Reform and Immigrant Responsibility Act in 1996. Known as IIRIRA (pronounced “ira-ira”), the law expanded mandatory detention and the number of deportable crimes. As the federal inmate population doubled, prison-like immigrant-detention centers rose up in tandem. Raff reports that in the early 1990s, there were around 5,000 immigrants detained each day; by 2001, the population quadrupled. And the Trump administration wants to keep that number growing: The president’s 2018 budget called for increasing the daily detainee population to 51,000, a 25 percent bump over last year. Raff reports that while the prison population has begun to dwindle in recent years—the incarceration rate fell 13 percent between 2007 and 2015—immigration detention remains “one of the fastest-growing sectors of the carceral state,” said Kelly Lytle Hernandez, a University of California, Los Angeles, historian who studies the origins of U.S. immigration control. “Local police are some of the biggest feeders into the immigration-enforcement system,” said Will Gaona, the policy director of the American Civil Liberties Union of Arizona. “And that’s more true in Arizona”—where Gustave was picked up—“because of S.B. 1070.” That 2010 state law, which has since been emulated in dozens of states, requires police to ask about immigration status if they suspect someone is in the country illegally. My opinion? Immigration and race relations certainly are hot-button topics in today’s administration. Hopefully,equitable decisions in the criminal justice system can be made which don’t unduly and/or specifically affect immigrants; regardless of their race. Please contact my office you have a non-American friend or family member who faces criminal charges. Immigration issues play a huge factor in how criminal cases are resolved. Erik Ortiz reported that a federal operation to arrest undocumented immigrants netted nearly 500 people in cities and states that have openly opposed the Trump administration’s deportation initiatives. According to Ortiz, Immigration and Customs Enforcement (ICE) officials said last Thursday that its four-day “Operation Safe City” targeted people in residing in the so-called “Sanctuary Cities” of New York, Los Angeles, Philadelphia, Denver, Washington and Baltimore as well as Cook County, Illinois; Santa Clara County in California’s Bay Area; Portland, Oregon; and Massachusetts. Officials in those places — some referring to themselves as “sanctuary communities” — have been vocal about not fully cooperating with federal immigration authorities, at times clashing with state leaders who support President Donald Trump’s agenda. Sanctuary communities have passed ordinances limiting compliance with federal immigration laws and seek to shield undocumented immigrants who may be deported simply over their immigration statuses or low-level criminal offenses. But the Department of Homeland Security scrapped the operation after the agency said it was halting nationwide enforcement actions in the wake of hurricanes Irma and Harvey. This latest effort indicates the administration is ready to renew its efforts. “ICE’s goal is to build cooperative, respectful relationships with our law enforcement partners to help prevent dangerous criminal aliens from being released back onto the streets,” Homan said. According to ICE, of the 498 people arrested this week, 317 had criminal convictions. Some were also categorized as “immigration fugitives,” “previously deported criminal aliens,” and/or associated with a gang. City officials declared Portland a sanctuary city in March, and its mayor, Ted Wheeler, has criticized the Trump administration’s push to end the Obama-era program that has allowed undocumented immigrants who came to the United States as children to remain in the country. The administration, meanwhile, has faced setbacks as it seeks to overhaul immigration — an issue that has failed repeatedly to gain traction in Congress. Weeks ago, a U.S. district judge in northern Illinois gave sanctuary cities a temporary victory, saying the Justice Department can’t withhold public safety grants to Chicago because officials there don’t want to impose certain immigration policies. My opinion? As a criminal defense attorney, my role is to protect people’s Constitutional Rights under the Fourth Amendment. Therefore, I have a natural inclination to prevent warrantless, unlawful searches and seizures. That said, I understand if the government declares a state of emergency holding that exigent circumstances warrants the immediate seizure and deportation of undocumented immigrants. However, there’s lots of controversy surrounding the subject of ICE raids on Sanctuary Cities. Some civil rights advocates say the raids fit with the Trump administration’s pattern of scapegoating, criminalizing, and demonizing immigrants. Also, courts have said that holding someone without a warrant could violate their constitutional rights, putting jailers at risk of lawsuits. Finally, others have accused Trump’s attack on sanctuary cities as a malignant executive power grab that subverts the Spending Clause and tramples the 10th Amendment. Let’s see what happens . . .